(Nanowerk News) Cotton reinforced with boron carbide is tough and hard but nonetheless elastic. These properties indicate future promise, but this material is not yet bulletproof. Boron carbide nanofibres surround cotton fibres like a dense fur. The diagram on the bottom right shows the structure of the reinforced fibres. (Images: from Tao X. et al., 2010). American and Chinese researchers, together with ETH Zurich Professor Brad Nelson, recently published a paper in the scientific journal Advanced Materials ("B4C-Nanowires/Carbon-Microfiber Hybrid Structures and Composites from Cotton T-shirts") in which they presented a new method that uses an ordinary cotton T-shirt as the raw material to make a tough, hard but flexible cloth. The University of South Carolina, which is heading this project led by Professor Xiaodong Li, suggests in a communiqué that more comfortable and more lightweight bulletproof vests for the police, for example, could be manufactured from this new material. The media seized on the topic with euphoria and reported that this kind of vest would soon be available. This is not inconceivable according to Nelson, Professor of Robotics and Intelligent Systems, who is involved in the research project together with his ETH Zurich team. However, although a successful breakthrough has been achieved with the method of manufacture, much more development work is still needed before conventional bulletproof materials, such as Kevlar, can be replaced. To create their new material, the researchers dipped strips of cotton shirt into a boron solution enriched with nickel, after which the pieces of cloth were heated to 1160°C in a furnace. At such a high temperature and under an inflow of argon, a furry coat of boron carbide nanofibres forms on the cotton microfibres. Boron carbide is the third-hardest known material at room temperature, and is in fact the hardest above 1100°C. After the nanofibres have formed, the cotton microfibres turn into boron-reinforced carbon microfibres. 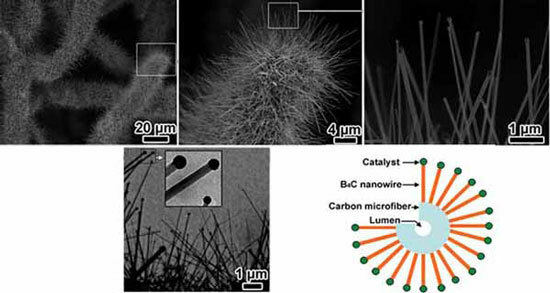 A droplet of catalyst material sits on the tip of each nanofibre. Unlike solid boron carbide, these fibrils are extremely elastic and flexible. This is shown by tests on individual nanofibres that Nelson carried out in his laboratory, which specialises in studies of this kind. Nevertheless the boron carbide nanofibres display the strength and rigidity of solid boron carbide. All in all the fabric itself remains light-weight and flexible like the cotton T-shirt, but at the same time it is also tougher and more rigid at the nanoscale. Brad Nelson is renowned for his innovative strategies and concepts in the field of micro- and nano-robotics. For him the emphasis is quite clearly on the development of the raw material. Although the T-shirt is important as a possible application, he believes the manufacturing process to be the key. Nelson finds the idea of being able to use an everyday material like cotton simultaneously as a support substance and as a catalyst, thus completely changing its properties, very promising and revolutionary. One could certainly imagine a large number of applications for such materials, from self-actuated loudspeaker membranes to light-weight aircraft materials to protective clothing for the fire brigade. In addition, the boron carbide cloth almost completely blocks out a variety of ultraviolet rays.